The codebot shell controls is an easy to use set of shell classes, components, and controls for Embarcadero Delphi versions 7 and 2009. The programming tools in this package allow you to programatic access object in the shell namespace. The shell namespace is represented in Windows by Windows Explorer (explorer.exe). These shell namespace exist include virtual folders like the control panel and network places, files and folders, and attached devices such as printers and scanners. Shell objects can be invoked to show property pages, execute commands and other programs. More information about shell objects is available in more depth in this article on the codebot website. A video walkthrough of the contents of this package is available here. As you open the runtime package you may receive version import messages asking to some files. This is normal, click yes or okay to any prompts. Once the package is open, select "Build" from your package project menu. The build should succeed. After you have built the runtime package close all projects. Again, click through any prompts to recreate any files. Once the project is open, select "Install" from your package project menu. This will build and install the runtime packages. You should see a dialog with a message informing you that the Codebot Shell controls were installed correctly. Close the design time package. You should now have a "Codebot Shell" tab with the following controls: TShellBubbles, TShellEdit, TShallPathEditBar, TShellTree, TShellView, TSmallShellImages, TLargeShellImages, TShellBinding. Open Delphi and create a new VCL from project. Select the Codebot Controls tab from the component pallet and drop the following components on your form: TShellPathEditBar, TShellTree, TShellView, and TShellBinding. Double click TShellBinding, select all the controls, and press OK. Press F9 to run the project. You've just built a functional version of Windows Explorer. TShellBubbles is a visual control which mimics the left most pane of an open dialogs on Windows XP. Like all Codebot Shell Controls, shell bubbles uses the Windows theming engine. In addition, again like all other shell controls, it relies on the shell system images. This means that the shell bubbles and all the other shell controls will visually "fit in" on your user's computer, without regard to the version of Windows the are running. The purpose of the shell bubbles control is to give the user quick access to frequent or important folders. As a programmer, you can add and reorder bubble items using special folder paths, or your own paths added programatically. You can set shell bubbles to use large or small icons, and you choose to turn off or on text labels. 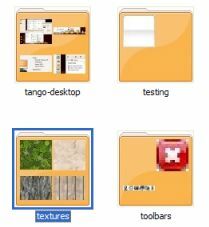 You can also control if the labels appear below or to the side of the folder's icon. 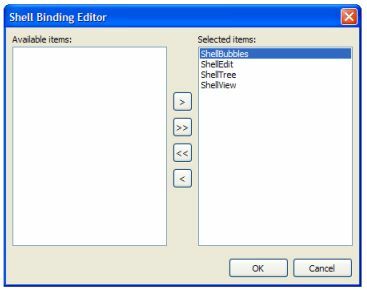 TShellEdit is a drop down edit control which allows the user to select a folder. The use can type or edit path names, or choose a folder from a drop down shell tree. You can set whether the user can type full paths, or paths relative to the current folder. You can also enable path completion, where a separate path combo is presented as the user types with a choice of folders and files that best match the user's input. TShellEdit and the related TShellPathEditBar are somewhat mutually exclusive controls. The shell edit acts like the explorer address bar from windows xp, while the shell path edit bar resembles Vista's newer bread crumb navigation bar. TShellPathEditBar is a Vista style bread crumb path bar control. As the path edit bar is a VCL implementation, it will work on Windows 2000 or later. TShellPathEditBar and TShellEdit are somewhat mutually exclusive. You may use either or both. One favors the XP explorer approach, while the other favors Vista. The control offers auto suggestion, drop down paths, and a horizontal shell node list separated by arrow bullet glyphs. Unlike the Vista bread crumb bar, you can choose to show icons at every node. You can also choose to always draw node buttons. Clicking an empty area allows you to edit the path as text. When no empty area is available, you can double click the control, or press space or enter, to invoke edit mode. TShellTree is a tree view control, but with TShellTreeNode item in place of the traditional TTreeNode items. Since the items in the tree are populated from the system shell, you cannot add or alter items without adding to or altering the information tied to the computer through the shell. The tree control is essentially the left side tree window in explorer. It will update in real time when your computer's shell objects change. Some useful features are detecting changes to the selected item, filtering or including items using the OnIncludeItem event, processing the default action to invoke custom code when an item is double clicked. You may also remove the context menu using the AllowContextMenu. Here is a simple idea for using a shell view control in your programs is to create a log file viewer. On one of your forms place a shell edit control which will be used by your users to check your applications logs files. You can point the shell view to your logging directory and filter the files based on log names for you application. You may also choose to have the log items sorted with the most recent first. You can then invoke you own custom log viewer when the user double clicks an log item, or if you log in test format, just allow the default action and notepad be launched opening your log file with no extra code. This approach make it very quick and easy to implement a log viewing feature into your own applications as the file system and the shell control handles most of the work for you. TLargeShellImages and TSmallShellImages are image list components which both refer to the system image list. Their handles are shared, so adding multiple instances of either component to multiple forms does not increase your applications memory usage. 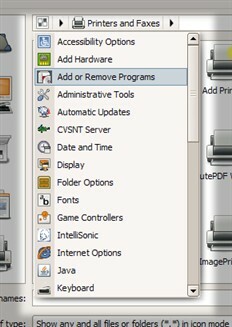 The large image list holds the normal icon scheme dependent on the users configuration. Typically these are 32x32 pixel images, but the size can be larger based on user settings. The small image list holds small icons, almost always 16x16 pixel icons. You can use these image lists with any control that has an image list property. TShellBinding is a component which can be used to synchronize changes between shell controls. Though not totally necessary, it alleviates the programming tasks of connecting changes in one control to another. The Codebot Shell Controls package contains a notable TShellNode class defined in the Shltools unit. It is helpful to understand what this class is and how it functions when using the shell controls units. In general TShellNode is a class which represents a namespace item. Typically, when working within the shell namespace you need to be very careful when working with pointers to system allocated binary data known as item id lists. Working with item id lists can be difficult, as you are generally required to take ownership of the memory as soon you touch it, and then dispose of it later using the system task allocator. This can all be very complex, but the TShellNode class takes care this and other tasks for you. The TShellNode class has multiple constructors based on the way you want to work. Here is a summary of the constructors. Create Create a node using a parent and a relative list. Either parameter can be nil. If both are nil the node refers to the system shell root which is the desktop. If parent is nil, then the new node is relative to the desktop. CreateFromList Create a node using an absolute list. If the list is nil the new node refers to the desktop. Clone Clones a new node using the specified class type. If class type is nil, the clone is of the same class type as the original instance. Note, if you choose use a contructtor with an item id list, the shell node then owns the list. You should not attempt to free the list or share it with another newly created shell node. Freeing a parent node, frees all child nodes and their item id lists. 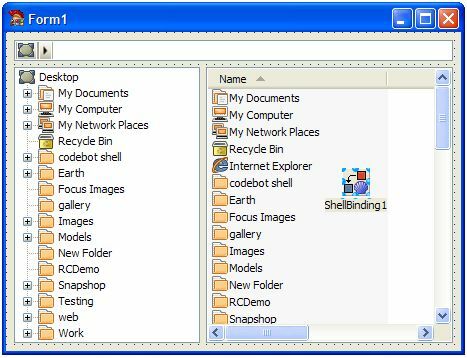 ShellFolder A reference to the current item's IShellFolder object. If this property is nil the node refers to a non-folder object.